Eu Yan Sang, founded in 1879 with the mission of "Caring for Mankind" is a global healthcare and wellness company with a strong foundation in Traditional Chinese Medicine. It manufactures and retails traditional Chinese medicine and herbs in Hong Kong, Macau, Malaysia and Singapore, and also operate clinic services in Singapore, Hong Kong, Malaysia and Australia. 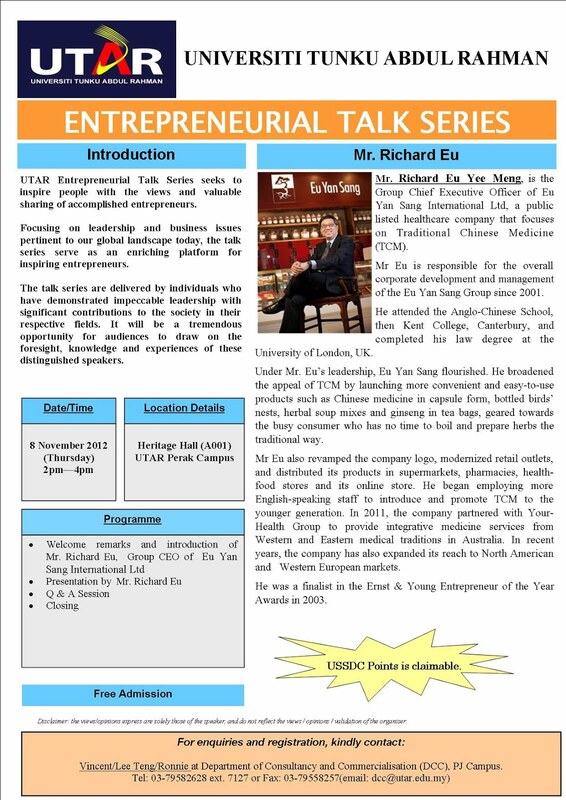 UTAR Entrepreneurial Talk Series presents Richard Eu, Group CEO of Eu Yan Sang International Ltd. Richard Eu attended Kent College, Catenbury, and completed his law degree at the University of London.